The aim here is to get a real working application made with this device and maybe even datalog coordinates.. we'll have to see. I do have a jump start on the coding if I build off of Matt's code from his post GPS in less than 30 mintues. I was wondering if you could post about how you went about designing your touch shield and how to interface with other LCD's with the arduino. I'm looking at the Varitronix VIA-415-DP-RC-S 4 digit 7 segment reflective LCD (40 pin) as a secondary display (digikey part #153-1017-ND) and am trying to minimize the digital i/o pins used for it. You're right... I think it's the best way to visualize the data from those things.. I think you're reading my mind! Oh, thanks for that link :) I'm fairly new to the whole LCD thing, so picking my way through it has been confusing at times. I've found a 4 digit 7 segment 3-6V IC there (http://www.maxim-ic.com/quick_view2.cfm/qv_pk/1675) but how do I know if it'll work with the VIA-415-DP-RC-S? Relatively elementary questions I'm sure...but I am a newb. We are using the Libelium GPS Shield to develop some auto-locate functionality to define when you are within a defined region (Geo-fence). The Shield has been great for that, but quite expensive. The new shield from Ladyada (http://www.ladyada.net/make/gpsshield) is quite a bit less expensive and has an SD slot for position logging. 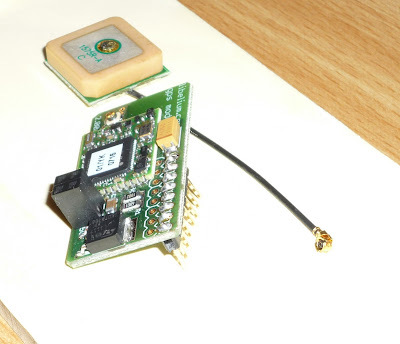 The GPS modules available are also SiRF III, which is a big advantage.